Elesha Paul Moses Interview - Tina Turner - What's Love Got To Do With It? Ali James Interview - Oh Yes It Is! 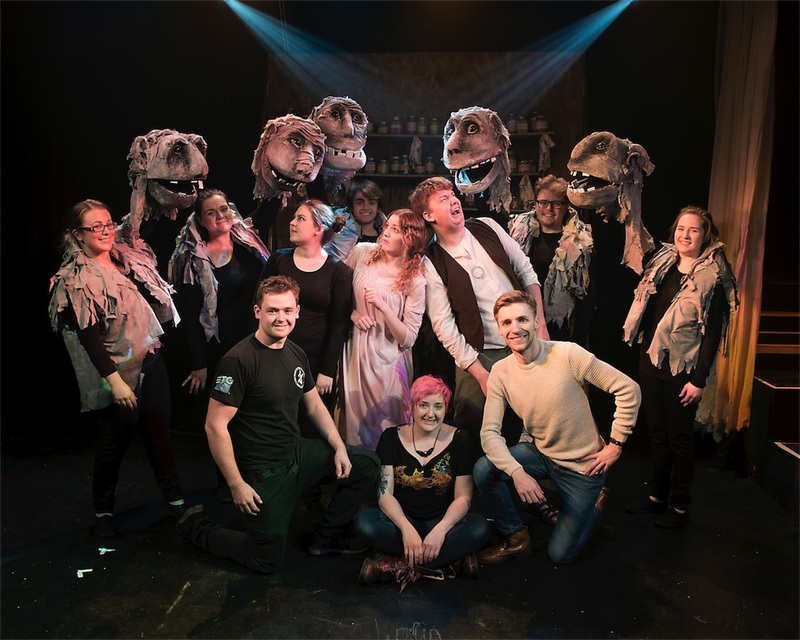 Nineteen12 Productions can pride themselves in being one of just a few drama groups in the area who provide not only Relaxed Performance shows but who also cater for those who may be deaf, hard of hearing, partially sighted or blind. I went along to an Audio Described and Signed show to find out just exactly what happens during these performances and to see what people can expect. I arrived at the theatre just an hour before the production was due to begin in order to participate in the Touch Tour. This tour allows audience members, who require it, to have the opportunity to walk around the stage and literally touch the set, hold props and feel parts of the scenery that will be used during the show. For those who are unable to see or who are partially sighted, this makes a huge difference to the way the show is perceived and later when they are sitting in the auditorium they can wear headphones which will relay a spoken description of the action that is taking place on the stage. I decided to use these headphones to get a feel of what it would be like. For the hard of hearing or deaf, the company hired Taz Hockaday from the TheatreSign company to sign for the show. This particular show just happened to be Taz’s first job for the company, although she has been interpreting for the deaf for many years. As it was her first show, she was being assessed by a member of the TheatreSign company and, oh my goodness, she certainly had her work cut out for her with this production! 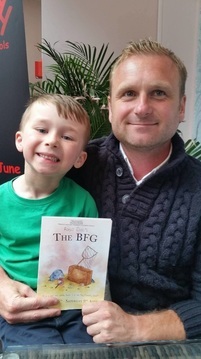 For those of you who are unaware of the story, the play of The BFG is adapted from Roald Dahl’s children’s book of the same name. Sophie is a young orphan who is snatched from her bedroom window by the BFG and taken to the land of the giants. Luckily for her, he is a friendly giant and they soon become friends, despite the fact that the BFG speaks in a rather strange way and eats and drinks rather odd food - like snozzcumbers and fizzy pop. I did feel for Taz having to sign for this play with the BFG’s extremely strange language and in one particular moment when the BFG confesses to Sophie that, “Words are a squelch tricky problem for me. I’ve got Terrible Wiglish.” I did wonder what on earth Taz would sign for that! Another amusing moment was when the fizzy drink made the BFG ‘whizz pop’ (breaking wind to those of you who may not know…). Whizz popping was clearly something the giant thought was huge fun and I had to chuckle at the fabulous audio description, after Sophie tries the drink, which was explained through my headphones with, “Sophie is propelled into the air as she whizz pops merrily!” Fabulous! There are some lovely moments with the BFG catching dreams with his net, venturing into a delighted audience and depositing them inside dream jars that all lit up in different colours. Again, a nice touch with bubbles flowing down from the ceiling over us at one stage too, which really went down well with the children in the audience and also being relayed over the Audio Description for those not able to see this. With the show being predominantly performed with puppets, the need for Audio Description was even more evident and although the movements were subtly described to me over the headphones, this never interfered with the flow of the performance and with what the actors on the stage were saying. Likewise, with Taz standing in the left-hand corner of the stage; she never distracted us from the what the actors and puppets were doing throughout the show. All the characters in the play were performed by the actors using the puppets but additionally Sophie, played by Alice Lane, doubled up as puppeteer as well as being dressed and acting as Sophie herself a couple of times. Every single puppet looked amazing and again, they were described through the Audio Description in good enough detail to enable the listener to be able to visualise them. 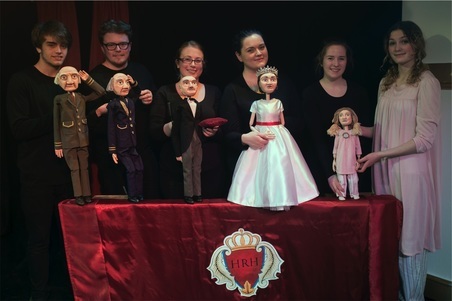 Claire Brooks has done a fabulous job, not only with directing the cast but also designing and making all of the puppets, with the cast doing an equally marvellous job in bringing them to life and making them appear in quite a realistic and naturalistic fashion. The five giant heads in particular are quite magnificent and you could sense that a few small children in the audience would not have relished having to be too close to them, particularly when one of the giants exclaims that they’d like to eat some English human ‘beans’! Josh Picton gives a great portrayal of the BFG in every way, from his oddly complicated language, down to his very look. The interaction between himself and Sophie was always very convincing, whether it be with the puppet of Sophie or with Alice, playing Sophie herself. The set was inventively furnished overhead with cobwebs and the stage adorned with dream jars with numerous lightbulbs of different shapes and sizes hanging down. Technically intact with the accompanying light and sound effects and even smells, this made for a completely immersive experience for everyone in the audience. The company will be doing a Signed and Audio Described performance on the Saturday evening during their next production, Agatha Christie’s And Then There Were None. This is coming to The Dixon Studio on the 13th-17th September with a Touch Tour for the blind or partially sighted patrons beginning at 6pm. Congratulations to Nineteen12 Productions, for not only producing a fabulous production; but also for making a theatrical experience which is inclusive for everyone in our community. A special note of thanks to Taz Hockaday - I really hope her assessment was successful and also to Alex Abineri, whose gentle tones were spoken through my headphones in the audio description. "I thought it was really, really good. The BFG was the best because he was really funny. I liked the bubbles too - I caught one! I liked the bit where he caught the dreams." "It was a brilliant performance. The BFG was acted really well and the puppets looked great, in particular the big giants. I liked the army generals too and the Queen was funny." 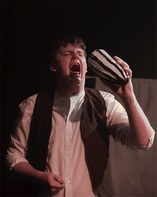 "It was a shame that some of the children in the audience were chattering and making noises with sweet wrappers, which was a big distraction as far as I was concerned." "I thought it was really good, although I was surprised that it was a puppet show as that wasn't really mentioned in the publicity. It was a fantastic show and great that it was a signed performance as it helps my daughter, Phoebe. Phoebe has been deaf from birth but had cochlear implants 4 years ago and can now hear relatively well as long as there isn't a lot of background noise." "It was really good and good that the interpreter was there too. 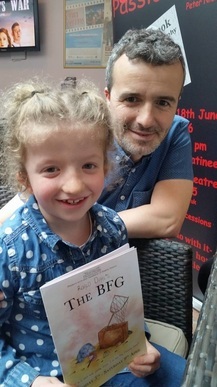 I liked it when the BFG was bouncing up and down whizz-popping, that was really funny and I thought the puppets were really good."